Seeing as my computer is crapping itself, I'm trying to find a place to set this, so I'll leave this here.. The story begins as you are being talked to by a lady, "Wow! Look at all the trouble you've gotten yourself into! Hmm, I see you've received your Pokemon already." You have a flashback, A few days ago you were drunk and are arrested, you wake up 3 days later [today] and as your are leaving your cell a police officer talks to you, "Hey... unfortunately the state wants us to give you a Pokemon to learn discipline." You chose your Pokemon, and you know... you better not being expecting any fancy Pokemon, you are given the choice between, Rattata, Sentret, or Zigzagoon. You chose your Pokemon and are told you can leave after you talk to the lady. You exit the flash back. Now, you leave the jail cell and go to your house. Your buddy is there, "Man! I am so sorry, we didn't think you'd get busted!" You reply, "Yea, it's alright... but... I got this," and you show your friend the Pokeball, "Wha-...Ho-...Is there a way to make money off this?" You ask your friend. Your friend replies, "Well, either you can breed it and sell the eggs in the black market, or you can participate in Pokefights." [which are like dogfights]. You say to your friend, "Well, I don't want to be anywhere near that things 'business'" and you decide to participate in Pokefights. 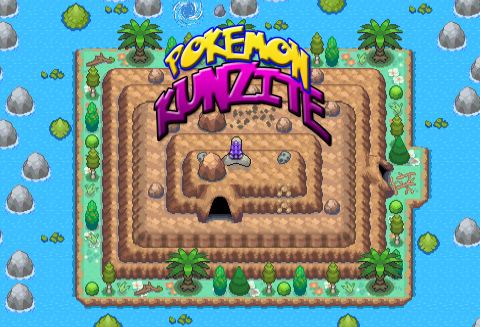 There are 12 Pokefights throughout the region Tizunke, each time you win a Pokefight you are awarded a starter Pokemon. Now you may be asking, why not just participate in gym battles? Because to participate in a gym battle, you must be part of "the league" which is what it is in the mainstream games, all the gyms and the Elite 4. After the 12 Pokefights you are encountered by a strange man, "I've been watching you, you are a truly great trainer!" He says to you. He then takes you out to a quiet place and asks, "You ever heard of the Kunzite stone?" You reply, "No, why?" He starts to laugh... "Well, the Kunzite stone is a gem so powerful it is capable of bending time and space" You say, "No way, there is no such a thing." The man takes out newspapers from years earlier, "See this, the title reads 'Strange happenings could be linked to Kunzite Stone'" then he shows you a few more papers, "Okay I believe you, but what should I care about it?" You ask. "Well, there is no doubt the stone exists, but is there a way to possess the stone? If we could find the stone, we could be rich, we could be all powerful!" The man starts to laugh again... "Well... where is it?" You ask. "No one knows, but there is rumors it is off the coast of Revocove!" You stare the man in the eyes, "You're kidding me right?" and the hunt begins! You come across the gem right where the man suspected, It is atop a mountain in the middle of an island. You get to the top and get the gem. You return to the man, "I... I got it... but I don't feel any different..." The man looks at you bewildered... "WHAT?! You're alive?!" He looks at you head to toe, "HOLY CRAP! You survived?!" You stare at him with a confused look on your face, "What...? It was just outside the cave on top of the mountain on the island... Oh... I guess that is a hard place to find." You pass the gem to the man, "This is definitely it alright!" he says, "Here you hold it." He gives you the gem back, "What?! I thought you were going to make me rich and powerful." The man says, "Honestly, I didn't think you'd make it back, I have a few books I have to read before we can use any of it's powers." You stare at the man, a little angry... "Alright then... You make sure to call me when you're ready." A few days later you come back to the house, "You ready?" He looks at you, he'd been crying... "Look at the TV!" On the TV was a news report: "Strange occurrences throughout Tizunke, could be in relation to the Kunzite Stone! : It seems as though, the wild is desolate today... It seems every single Pokemon in the Tizunke Region has disappeared." You look at the man, "What should we care?" You look at the man. "Come on, you are not that hard headed are you?!" You stare at the man. "Come on, we have to return this gem!" You return to the island with the man, you get through the cave and at the top of the mountain there is a new chamber! "This wasn't here before..." You look at the man. "Should we go in?" You enter and inside you see 4 ferocious creatures battling to the death. "Mewtwo... Celebi... Deoxys... Giritina..." You step forward and hold the gem in front of you... You raise it above your head and everything goes silent.. The four legendaries turn towards you... You throw the gem down to the ground full force shattering it, "Nooooo!" The man yells from behind a rock! The room flashes, You awake to find yourself alone in the chamber, you leave and fly to your hometown. There are Interviewers everywhere, apparently Mewtwo had come and spoken Telepathically to people, looking for you, and told of the incredible feat you had performed, in restoring the balance to the world. After you restore order to the world... what now? I mean... of course fame, fortune and all that.... but... is this the end of the game? Am I trapped to just catching all the other Pokemon I may have over looked? After your court date you can now take a boat to one of the 4 islands harboring many secrets. You can also enter gyms and the elite four! 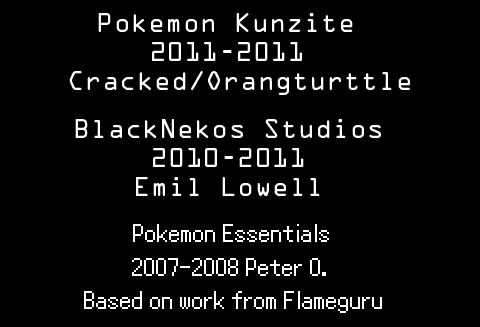 First off, Pokemon is a trademark of "Nintendo". I do not claim any of the features of the engine. I do not claim any of the sprites or characters. Good luck with it. I love the detailed maps. YAY POKEMON!!! xD Keep up! It looks great so far.